Fed up with the city smoke? 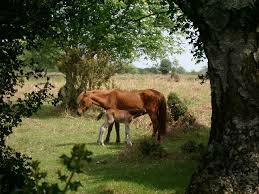 Why not escape to the New Forest and see the foals arrive? A couple of days of foal spotting whilst exploring 94,000 acres of open moorland and ancient forest, plus a delicious dinner is the perfect escape. Why not stay in the heart of the New Forest village of Brockenhurst at the Cottage Lodge Hotel and cycle out on the wide logging trails, perhaps even with a backpack and a picnic, for a day of foal spotting? 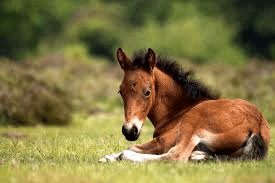 Say: May Foals, on booking and we will give you free tea and crumpets to enjoy in front of the fire after your day exploring the New Forest National Park. The New Forest foals arrive through May and early June. They are charming. Wobbly legged, shy and blinking in the sunshine. The New Forest comes alive when new foals start gambling together over the open plains. The Forestry Commission prepare themselves for phone calls from anxious visitors reporting foals lying still (generally they are asleep), or ponies looking uncomfortable (in labour), or foals too close to road (they like the grass on the verges). Foals are for looking at, not for touching. They are very much at home on the open forest, and they are accustomed to people, bikes and cars. But, the foals and their mothers live as wild animals.Which makes it even more interesting to see how contented and healthy they are on the New Forest. 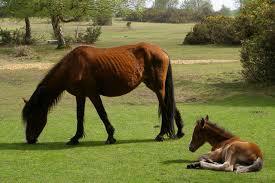 There are 5000 mares on the 94,000 acre New Forest National Park. They are not all in foal, but there could be as many as 1000 foals during May and June. Foal spotting is the favorite game of my children (even though they are now young adults). Cycling through the forest on the wide logging trails spotting foals is an annual treat. It is so easy to get out on the Forest from the Cottage Lodge. Ponies often bring their foals into the village to ‘show them off’. So you may well be able to see them from the hotel itself. Last year a very thoughtful mare produced a beautiful foal outside the property for our guests to admire and photograph. The mare stayed close to the hotel with her beautiful offspring for a couple of weeks and then headed off into the forest. Why not have a browse of our rooms?